GemConcepts Ltd, a unique diamond cutting facility, established in 2010 by Yoram Finkelstein, a second generation diamond cutter with its main expertise in designing and cutting period cuts and exclusive diamond shapes. With over three decades of experience cutting & polishing exceptional diamonds, Yoram Finkelstein has earned the knowledge and capabilities to complement appropriate diamond cuts to any jewelry design Era with their distinct gem appearances and characters. GemConcepts has been supplying prominent jewelers across the globe with unique diamond cuts & solutions to complement their design needs. In addition to our loose diamond offerings, GemConcepts is now offering exclusive jewelry featuring our unique diamond creations in combination with our old family collection of antique colored gemstones, a perfect marriage. Currently we are starting to offer one-of-a-kind and bespoke creations. Creating unique diamond cuts is a passion, allowing me the luxury of working in collaboration with our clients to optimize their design and purchasing experience, bringing joy and relaxation throughout the process which concerns many people. We make sure client comfort is a priority in the whole purchasing process. By understanding our clients needs, we supply diamonds cut to balanced proportions which allow for efficient designing & setting capabilities, one of the more important feedback we have received from our clients throughout our years in business. My name is Yoram Finkelstein, I am also known as Yoram F (on various online platforms) and as “DiaGem” (on PriceScope.com). I am a second generation Diamond cutter/cleaver and the founder of GemConcepts. I shape rough Diamonds into unique Diamond cuts and looking back on my career, I can’t help but think about the experiences that similarly shaped who I am today. As this is my first blog post, I thought it was only fitting that I look inward and share how GemConcepts came into being. I was raised in Antwerp, Belgium and Beverly Hills, California. My late father was pioneer in the early days of the Israeli Diamond industry (circa 1940’s). 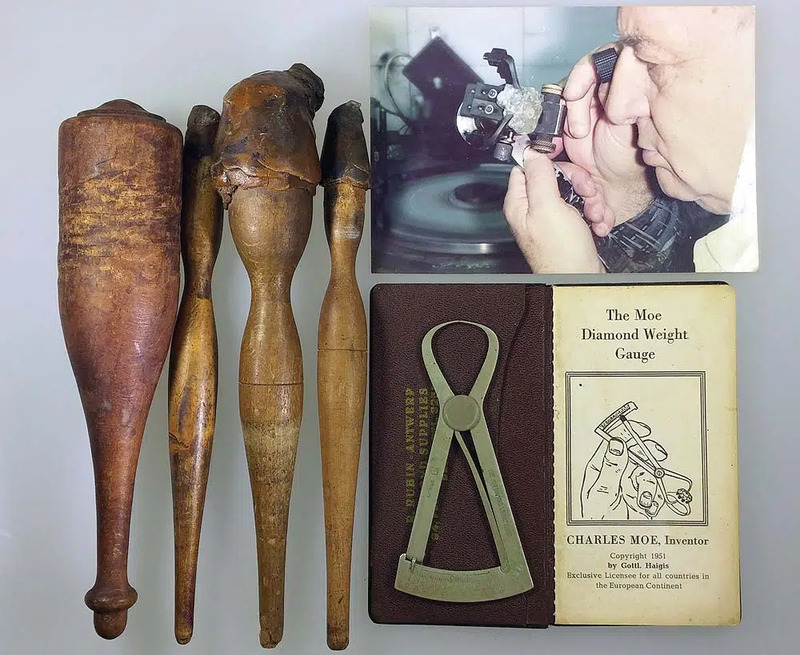 He was a cutter and cleaver of large Diamonds (specials, 10.80 carats+) operating from the backstage of the Diamond industry. What do I mean by that? Well, my father was never one for the limelight. He preferred to do his work behind the scenes and preferred to focus more on the professional side. His well known reputation was highly appreciated by many Diamond professionals around the world. As a child, I can still remember my father bringing his work home. In the middle of the night, I would hear the squeaking and chirping sounds of Diamonds being cleaved. In the 60’s and 70’s you would need to rub two Diamonds together to create a cleft, which you’d then use to deliver a strong blow which divided the Diamond. You were limited to four cleaving directions and two more via blade sawing. If that sounds limiting its because it was. Of course today we can use lasers to divide a Diamond in any chosen direction. This image displays some of the old tools used by my father back in the days. The funny metal clippers were used to measure the rough, this was called the Moe gauge. I include an image showing my father opening a window on a 300+ carat rough Diamond. 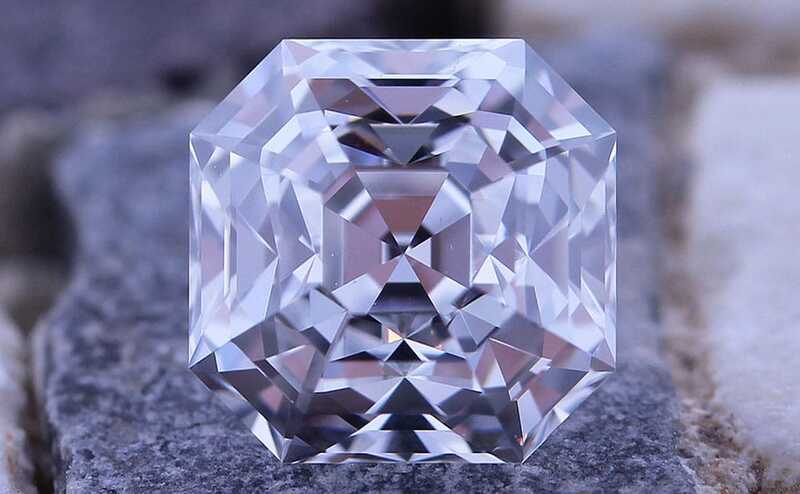 One of the last Diamonds he planned and cut before his passing. It was probably inevitable that my father’s passion for Diamonds would rub off on me. He taught me the skills of the trade and showed me how the business side operated. I took it all in and as a young man, I started my own business buying rough and cut Diamonds to market them at a profit. Working with generic diamonds was a good little business, but after my father’s passing in the mid-90’s I started to lose my passion. The business was becoming more and more competitive but my biggest issue was that it felt like craft, not art. My creative side was thoroughly bored by the experience. I think on some level I was waiting for a strike of inspiration. And then one day it arrived. About nineteen years ago (circa 1998) I was involved in a project designing and bringing to life a specialty Cushion Cut Diamond. This was something different. This was a challenge. This was interesting. While researching and developing the new cut, which needed to exclude any prior art, it forced me to educate myself on the History of Diamonds and the cutting techniques from the period. I felt like a musician who just discovered Mozart. It may sound silly, but I was mesmerized. Once the hidden charms of the world of Period Cuts had been revealed to me, there was no turning back. I was offered a beautiful 2.26 carat Antique Old Mine Cut, I purchased it and planned it as the center piece of my wife’s ring. Now all I needed was accent Diamonds for the “halo” and shoulders I was planning. But where would I find fifty tiny matched colorless Old Mine Cut meleé Diamonds? Call it inspiration. Call it madness. I ended up creating all fifty myself. It was a challenge but one that thrilled me and pushed me to further explore the world of Antique Cut Diamonds. Before long I was exclusively cutting fine rough Diamonds into Old Cut Diamonds. The industry at the time was mainly interested in modern generic Diamond Cuts so I probably seemed kind of an odd bird. But being odd and unique must love company, I was soon after supplying my cuts to distinct antique & vintage jewelers and a few contemporary designers who dared at the time to set their creations with Old Charm Diamond Cuts from the past. 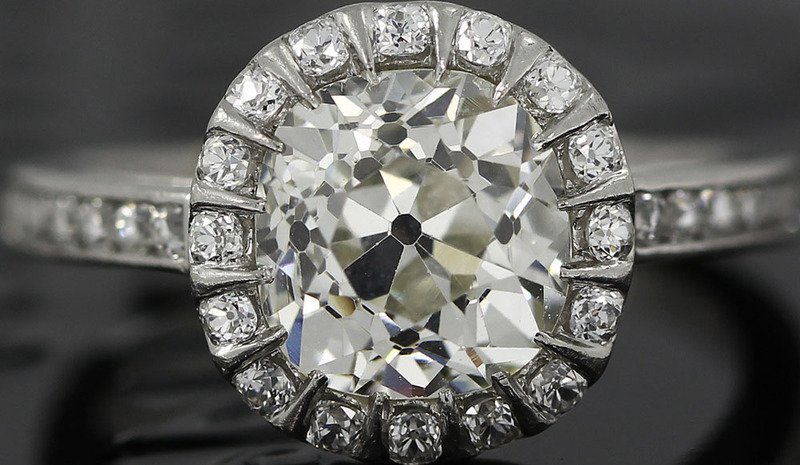 Antique Old Mine Cut Diamond set in a platinum ring. This ring was crafted by me, for my wife and was also the origin of my professional journey into Period & Antique Diamond cuts. The tiny (one point) Old Mine Cut Diamonds set in the Halo and shoulders were crafted by me personally. To broaden the market for my Old Cut Diamonds I decided that education was the best approach. Whether it was someone from the industry or just laymen or women interested on the topic, I would find myself passionately advocating for the virtues of Period Cuts. It was probably inevitable that I’d eventually get hooked on discussing Diamonds online. In 2004 I became an active participator as DiaGem on PriceScope.com, a leading Diamond education & advocacy website. Participating on forum discussions for so many years allowed me to interact with professionals and consumers all over the world, it was and still is a great learning experience which allowed me to further develop worlds I didn’t know intimately. Eventually this led to my involvement with the designing and bringing to market of “August Vintage© Old Mine Cut” and “Octavia™ Square Emerald Cut”, both cuts combining Antique Diamond shapes, facet designs and proportions while adapting new cutting technologies that emphasizes 3D optical performance and symmetry. These two Diamonds triggered a new line of offerings called GemConcepts “Signature Cuts”. The harmonious combination of Period Cuts and innovative cutting technique which bring the most of both worlds. That brings us to present day. A little wiser. A few more grey hairs. But still as inspired and passionate about Diamonds as I’ve ever been. If you’re reading this you probably share this passion. I want to thank you for your support, your inspiration, and for listening to my story.